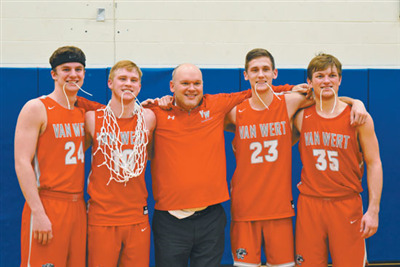 VAN WERT — Mark Bagley has stepped down from his role as the head coach of Van Wert’s basketball program. For the past six years, Bagley has been at the helm of the program. He has amassed a record of 67-78, and won two Sectional Championships, as well as being a one time District Runner-Up. The last three winters have all be winning seasons— this past winter being the most successful. Van Wert went 16-10 this year, including a win over state-ranked Wauseon in the Sectional Championship. Bagley has spent 26 years coaching, slowly working his way up the ranks, first as an 8th grade coach at Ottoville, then for the Cougars’ junior varsity, before joining the varsity squad as an assistant. In 2013 he took over as the Head Coach of the Cougs. Basketball has been very good to me. For 26 years, I have invested my time into the greatest game ever invented, and tried to pass my knowledge onto the players at Ottoville and Van Wert. Before becoming a coach, I watched or played basketball from the age of zero until 21, and loved every second of the competition and being part of a team. I wanted to be just like my brothers and play for the Van Wert Cougars. The Van Wert Basketball program means everything to me and I take great pride in what has been accomplished over the past 24 years. Coaching with Jeff McMillan at Ottoville and Dave Froelich at Van Wert was the best thing that ever happened to me as a young man. They trained and mentored me to do things the right way, compete with class, and always put everything and everyone above me as a servant leader. I am retiring/resigning from the head boys basketball coaching position at Van Wert High School. The expectations I have put on myself and the program have affected me as losing has become too difficult, and winning never seems to be enough. I do not have any desire to coach again at any level or anywhere else. It is time for a new era of Cougar basketball. We did not win as much as I would have liked, but my relationships with former players and being a servant leader is what I leave behind for others to follow. Winning is important, but I hope to never associate my success in life or what kind of person I am based on wins or losses. I will always be a Cougar and expect the program to flourish and become even better. The players are what make this all happen and I can’t thank them enough for the joy they provided in my 26 years. We were fortunate to coach great players and more important, better people. I was able to coach my son, nephews, and so many wonderful players. We do leave behind 56 players in the program that will do amazing things and I’m sorry it never works out to coach every kid. Thanks for believing in us as a staff and look forward to retelling stories down the road. Thanks to all the wonderful coaches I have had in my life as a player, the coaches I competed against, and all the coaches who have coached with me. Without their loyalty, friendship, and support this lifelong dream could have never been accomplished. Coaching is a family affair and the current coaches of Chris Covey, Ben Laudick, Brandon Miller, Jeff Hood, Kerry Koontz, Nate Hoverman and their families are why we coach, and go through the good and bad times. My family means the world to me and they have sacrificed so much. I love them very much, and have put myself ahead of them for 26 years. My wife, Rachelle, has been there for me the entire journey and always supported my love for basketball. Drew and Maria have embraced the coaching life, always wanted the best for me, and shared in my sorrows and joys. My grandparents, parents, brothers, sister and their families have always been Cougar Fans and provided great support. It is time to pursue other goals and dreams. I thank the Van Wert City School District, Board of Education, and administration for putting their trust and faith in me as a leader of young men. Thanks, God Bless, and GO COUGARS!